Whether we’re talking about residential or commercial roofing, sections that feature a low slope or are completely flat can become some of the most crucial areas in your roofing system. When not properly maintained, these areas can become hotspots for trouble when it comes to moisture infiltration. Your roofs can become compromised when left exposed to the Colorado weather, resulting in costly repairs or the installation of a new roof. When it comes time for you to find a professional roof replacement in Fort Collins, reach out to Schroeder Roofing. For over 20 years, we have worked hard to be Northern Colorado’s roofing contractors of choice, delivering quality results that are sure to exceed even the highest of expectations. Our industry experts focus on superior service, unmatched professionalism, and building our quality reputation to get the job done. From minor roof repairs and inspections to full residential roofing installs, our contractors are here and ready to improve your property. We’re proud to be your go-to roofing contractors in the community, offering solutions for a wide variety of needs. Today, we’ll begin to look at rubber roofing and the benefits of this material for homes and businesses with little to no pitch to their roofs. When done, be sure to reach out to our experts for quality roofing services for your building! Longevity is the name of the game for many roofing companies. While most roofing materials are built to withstand the elements, few offer the impressive durability of EPDM. A recent batch of inspections by the EPDM Roofing Association found that the high tensile strength and high level of resistance to damage made a majority of 30-year-old roofs checked perform as “like new” in terms of appearance and the ability to keep moisture out. When you consider the fact that many roofs fail to live for more than three decades, this is pretty impressive! It’s also important to note that the performance of rubber roof materials heavily depends on the quality of installation by your local roof replacement company. Synthetic roofing materials may worry you when it comes to extreme heat and cold. While the southern states face a lot of heat and sunshine through a majority of the year, northern states must deal with the bitter cold and freezing temperatures for months at a time. Colorado is often joked about for its weather patterns, seemingly bringing extreme weather patterns such as snow and sunshine in the same day. EPDM is able to be used in nearly any climate, making it ideal for low slope roofs in the Centennial State. This material provides reliable energy performance, keeping your heating bill in check as well! When it comes to roof replacements in Fort Collins, residents have a wide variety of materials to choose from. 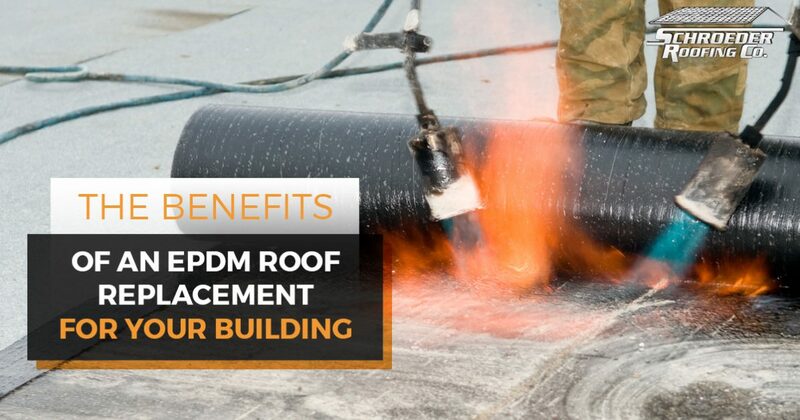 Next time, we’ll continue this topic by discussing a few more benefits of EPDM roofing materials, as well as a few concerns. If the roof on your home or business is looking worse for the wear, we can help. Contact us today to receive a quote on your roof repairs or replacement!